Israel shot down "a target" over the Golan Heights, hours after it was accused of a missile strike at a military site near Damascus international airport. Israel deployed its Patriot missile defence system and media reported the target was a drone. 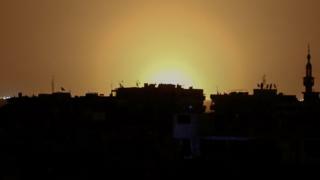 The earlier strike had damaged what Syrian rebels said was an arms depot run by Lebanon's Hezbollah movement. Israel said the explosion was "consistent" with its policy. But it stopped short of confirming it was responsible. The Israeli military Twitter account then announced it had intercepted the later "target" over the Golan Heights on the border with Syria, without elaborating. The military declined to confirm the target was a drone. Israel regards Hezbollah, and its key backer Iran, as its biggest threat. It went to war with Hezbollah in 2006 and the group has grown considerably more powerful since then. The Syrian Observatory for Human Rights, a UK-based monitoring group, reported that the powerful blast was heard across the capital at dawn on Thursday and that it was believed to have happened near the main road that leads to the airport. Syrian state news agency Sana said several missiles had been fired at a military site south-west of the airport, causing explosions that resulted in some material losses. Pro-government Al-Mayadeen TV cited sources as saying that missiles had been fired by Israeli jets flying inside the Israeli-occupied Golan Heights. Two senior rebel sources based in Damascus told Reuters news agency that the missiles had hit an ammunition depot in a closed military area that was used by Iran-backed militias operating alongside the Syrian army, led by Hezbollah. Appearing to confirm Israeli involvement, Intelligence Minister Israel Katz told Israeli Army Radio: "I can confirm that the incident in Syria corresponds completely with Israel's policy to act to prevent Iran's smuggling of advanced weapons via Syria to Hezbollah in Iran. Naturally, I don't want to elaborate on this." "The prime minister has said that whenever we receive intelligence that indicated an intention to transfer advanced weapons to Hezbollah, we will act." The Israeli military declined to comment on the reports, however Israel is thought to have bombed arms shipments intended for Hezbollah several times since the Syrian conflict began. In a rare step last month, the Israeli military confirmed that its jets had struck several targets inside Syria in a raid that prompted the Syrian military to fire a number of ground-to-air missiles, one of which was intercepted over Israeli territory. On Wednesday, a high-ranking Israeli military officer briefed reporters that approximately 100 missiles intended for Hezbollah had been destroyed in the raid. 23 April 2017: Alleged Israeli attack on a training camp used by militia in Syria's Golan Heights region, kills three members of the Syrian pro-government National Defence Forces, according to the group. 17 March 2017: The Israeli military says its aircraft attacked several targets in Syria and shot down a Syrian missile. 22 February 2017: Israeli aircraft reportedly bomb several Syrian air bases near Damascus, including a Hezbollah convoy travelling with the Syrian army. 12 January 2017: The Syrian government accuses Israel of firing several rockets on the Mezzeh air base from the Sea of Galilee. 30 November 2016: Israeli aircraft fire missiles on the Syrian town of Saboura, west of Damascus, according to Syrian military sources. 18 January 2015: Six Hezbollah fighters and several Iranian soldiers, including a general, die in suspected Israeli air strikes in Syria's Golan Heights region. 19 December 2015: Suspected Israeli missiles hit Jaramana district of Damascus, killing nine Hezbollah fighters, including leading figure Samir Qantar.